BP-1400 Backpack Vacuum Cleaner Cleaning has never been so easy. This commercial grade vacuum from Koblenz has a powerful 1400 Watt/11.5 amp motor but is lightweight weighing in at only 11 lbs. It features a 4-stage HEPA filtration system, low-noise operation (only 71dB) and maximum operator comfort. It has a 50' pigtailed line cord which allows for cleaning largr areas and saving time. It is ergonomically designed with padded shoulder straps. 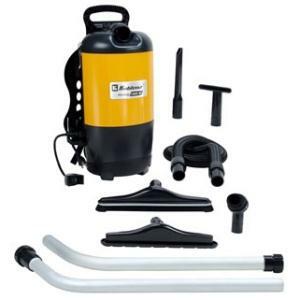 Comes with disposable filter bag and complete set of tools: 5' stretch hose, 2-pc. wand, carpet tool, 14" bristle floor tool, crevice, dusting and upholstery tools. This professional backpack vac offers versatility, durability and great performance.